Typical Deep Initial Spring cleaning quotes range from $35-$100 (1-4 dogs)... Factors primarily include # of companions, size of property to be cleaned, and how many months since last thorough cleaning. Confirmation of quotes are given directly over the phone. Call us or inquire online if we are closed. We promise to respond quickly! 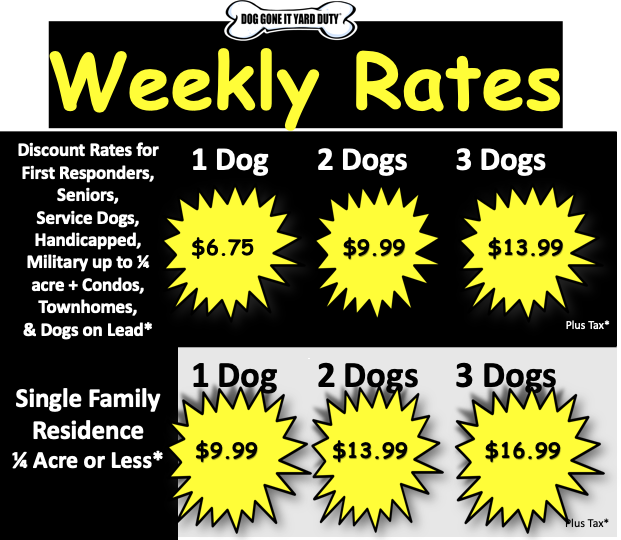 Strongsville Resident Rates listed above. Live outside of Strongsville? Just slightly more... contact us for firm rate quote! Dog Gone It Yard Duty is available for dog waste pooper scooper services in and around Strongsville, Brunswick, Brunswick Hills, Columbia Station, Olmsted Falls and Township, Berea, Middleburg Heights, Parma Heights, small portion of Parma, Hinckley and North Royalton Ohio. Tom and his crew are wonderful. They have been picking up after them for 4 or more years. My greyhounds look forward to them coming, and nearly pout on the days Tom or Shel don't come! If they identify a problem with the dog (something yucky in the poo) they let me know right away, and try to remedy the problem. These people are genuinely nice, caring people that look after and clean up after our 4 legged friends as well or better than I do. My only regret is not finding them sooner! Request a call back today to start enjoying hassle free service!